RICK’S TOP PICK!THIS IS A KNOCKOUT! We rarely find a 1950 Franklin in PF 67 Cameo, much less one that has superb Cameo eye-appeal like this beauty! 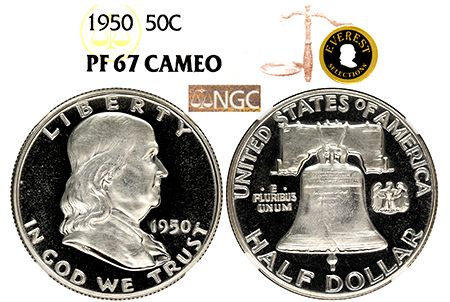 There are only 505 Cameo examples graded total by NGC, and of those, only 15 made the PF 67 Cameo grade. Only 6 examples are graded higher, with NONE graded PF 69 Cameo! This is a key date Franklin Cameo and has massive eye-appeal to boot! The obverse and reverse devices are painted in bright white and are fully frosted in snow. Black mirrors are completely free from haze and toning that typically comes with this year! No distractions, just a RARE, RARE, RARE 1950 Franklin Cameo in the SHOCKINGLY high grade of PF 67! This is THE 1950 Franklin if you’re looking for one of the best Cameo specimens out there!